A developmentalist, Dr. Tanner's research and applied work focuses on understanding and supporting development at the transition to adulthood. Learn more. 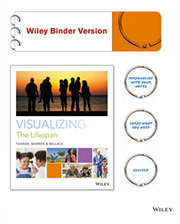 Dr. Tanner and colleagues published Visualizing the Lifespan, a text written to allow students to learn effectively by understanding the world around them and interpret what they see in a meaningful and accurate way. The content, design, and layout of the title takes advantage of the versatile capacities of students to learn visually. Young adult patients in their late teens are at risk for aging out of pediatric care. 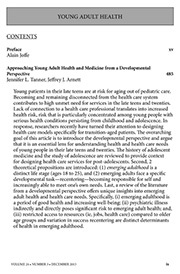 Becoming and remaining disconnected from the health care system contributes to high unmet need for services in the late teens and twenties…The overarching goal of this article is to introduce the developmental perspective and argue that it is an essential lens for understanding health and health care needs of emerging adults (ages 18 to 29). Dr. Tanner is an editor of The Yellowbrick Journal, a publication of the Yellowbrick Foundation for professionals that explores the challenges emerging adults experience throughout their transition into adulthood, focusing on the groundbreaking research and innovative treatments that are enhancing outcomes and changing lives. Members of the Society for the Study of Emerging Adulthood are invited to join Topic Networks, Special Interest Groups that bring together scholars interested in a focused topic related to emerging adult development and adjustment. Both the blog and Facebook page serve to build community among scholars and practitioners interested in emerging adult mental health. Dr. Tanner is co-founder of The Society for the Study of Emerging Adulthood (SSEA), a multidisciplinary, international organization with a focus on theory and research related to emerging adulthood, which includes the age range of approximately 18 through 29 years. The primary goal of the Society is to advance the understanding of development in emerging adulthood through scholarship, education, training, policy and practice. This goal is promoted through Biennial Meetings, the flagship journal Emerging Adulthood, and a website that includes information on topics, events, and publications pertaining to emerging adults from diverse backgrounds, cultures, and countries. Membership is open to researchers, policy makers, educators and practitioners with special interests in development during this period of life. 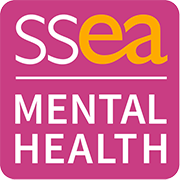 Dr. Tanner is currently a member of the Governing Council of SSEA and is Chair of the Mental Health in Emerging Adulthood Topic Network which organizes Preconference Workshop on Mental Health in Emerging Adulthood and meetings of the Topic Network.